Excel Bottling Company has been keeping families in the region happy with its flavorful sodas for more than 80 years. But a great deal of excitement at the company these days is around its growing craft beer business. Excel Brewing began making beer in 2012 and has grown a steady following along with an increasing variety of beer. Five beers are the stalwarts of the company and available year-round: Lefty’s Lager; East Side IPA; Southside Stout; Böse Roggen, a German style rye Schwarzbier; and Flash Bang, a wheat ale. But like most of today’s craft brewers, the company also develops seasonal beers, celebrating different flavors throughout the year. Winter Warmer is available now and the malty English-style strong ale is an ideal pour for cold nights. On tap for February is My Hoppy Valentine, an American Red Ale that’s like a well-balanced couple, bringing together tropical citrus and stone fruit with toffee maltiness. Other winter choices include a Baltic Style Porter that is aged in rye whiskey barrels and Black Breath Imperial Stout, brewed with roasted barley and pale chocolate malt. Not ones to rest on their laurels, Excel Brewing is always in creation mode so look for new releases in the months ahead. Forbidden Island, a New Zealand Double IPA is one of the soon-to-be-released beers. Monday – Tuesday and Thursday – Friday, 8:00 a.m. – 4:30 p.m. Check out Excel Bottling and Brewing’s website and you can find some fun recipes that call for a mix of the company’s popular sodas with beer or liquor. For instance, Excel Lemonade and Lefty’s Lager combine to make a super-refreshing Beer Shandy. Or blend Excel’s Rummy Grapefruit Soda with champagne and you’ll have a mimosa for your next brunch. With an every-growing lineup and such creative ideas always brewing, it’s easy to see why Excel is still a Clinton County favorite after all these years! 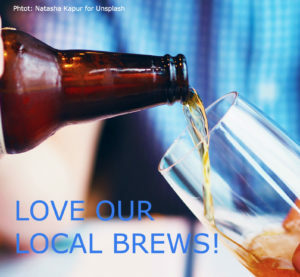 This entry was posted in Brewery, Food & Drink, Local Businesses and tagged Clinton County, Clinton County business, Clinton County tourism, Craft Breweries by admin. Bookmark the permalink.